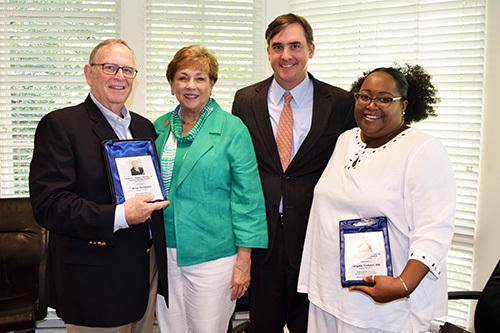 Winship advanced nurse clinician Tangala Colbert, RN and Alvin Goldstein, an eight-year volunteer, are the 2017 recipients of the Robert L. "Bobby" Rearden Spirit of Winship Award. Pictured: Alvin Goldstein, Dell Rearden, Robert Rearden, III, and Tangala Colbert. A Winship Cancer Institute nurse and a long-time volunteer are the 2017 recipients of the Robert L. "Bobby" Rearden Spirit of Winship Award. Tangala Colbert, RN, an advanced nurse clinician and Alvin Goldstein, an eight-year volunteer, were selected for the award because they exemplify Winship's culture of caring for the whole patient during and after his or her cancer journey. The award is given annually to one Winship faculty/staff member and one volunteer. "Tangala and Alvin have demonstrated exemplary service, teamwork, and a commitment to public good," says Walter J. Curran, Jr., MD, executive director of Winship. "They represent the spirit, enthusiasm and generosity that Bobby Rearden showed in his support of Winship." Colbert has worked with Winship's aerodigestive team for the past two years. She was nominated for the award by Suresh Ramalingam, MD, deputy director of Winship and director of the Division of Medical Oncology. He says "Tangala has been a key contributor to patient care activities. She provides compassionate care with a smile and empathy for patients." Goldstein started volunteering for Winship eight years ago after he lost his wife to brain cancer. Since then, he has logged more than 1,200 hours staffing the Plaza Level concierge desk. "Everybody knows Alvin's name," says DaVida Lee-Williams, director of Winship’s Patient and Family Resource Center. "He's had such a great impact on our patients and their families. Because of his dedication and commitment, he’s made a big difference at Winship." Rearden passed away in 2015 while undergoing treatment for a recurrence of leukemia. He was an Atlanta businessman and a member of the bid team that brought the Centennial Olympic Games to Atlanta in 1996. He served as a patient advocate on Winship's External Advisory Board which is comprised of national leaders at other National Cancer Institute designated cancer centers. He also served as honorary chair of Friends of Winship and was a founding member of Winship's Community Advisory Board.